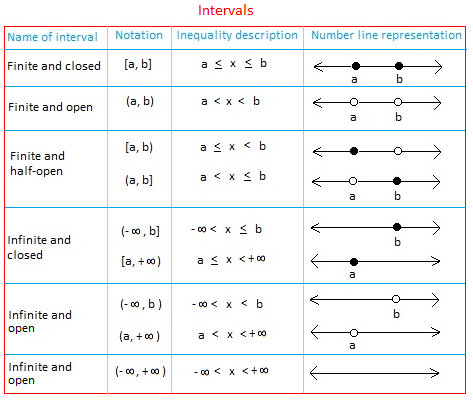 Use the table below in order to understand interval notation in math. An interval is a set containing all numbers between two given numbers. The set may have one, both, or neither of the two given numbers. An interval is open if the interval does not contain its endpoints. An interval is closed if the interval contains its endpoints. Sometimes, the interval may contain only one of its endpoints. 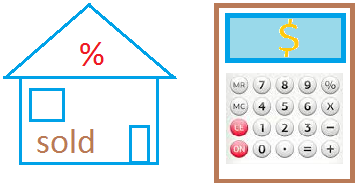 In this case, the interval is half-open. Notice the symbol ∞ which mean infinity. -∞ means minus infinity and +∞ means positive iinfinity. Why do we need intervals? They can be used to describe the domains of functions, bounds for estimates, and the solution sets of equations and inequalities. The length of an interval with endpoints a and b with a < b is b - a. The interval [2, 8) contains 2 and all numbers between 2 and 8. Notice that 8 is not included since the interval is open at 8.